August 5, 2010 - Mexicana Airlines filed a “Concurso Mercantil” or insolvency petition with a Mexico City district court to ensure the continued operation of the Company. Likewise, a Chapter 15 petition was filed with a New York bankruptcy court in order to obtain bankruptcy protection and injunction relief in both countries. 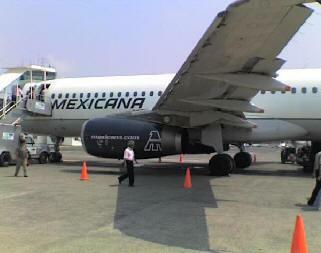 Mexicana Airlines is licensed as Compañía Mexicana de Aviación (CMA)it was the first airline established in Mexico. Today, in addition to domestic services, it operates to various destinations in North America, Central America, the Caribbean, South America and Europe (until 8/31). Its primary hub is Mexico City's Benito Juarez International Airport, with hubs at Cancún International Airport, and Guadalajara's Don Miguel Hidalgo y Costilla International Airport. Mexicana's main competitor is Aeroméxico, although the two companies “code-share” on several routes and was merged for more than a decade. It is North America's oldest airline and the world's third oldest airline operating under the same name, after the Netherlands' KLM and Australia's Qantas. The “Concurso Mercantil” is a Mexican legal resource that guarantees the operation of companies that are unable to meet their obligations, while protecting those companies they do business with. Similar to Chapter 11 of the United States Bankruptcy Code and other similar legislations, this recourse grants companies a reasonable timeframe in which to reorganize them in an orderly manner while continuing to operate. Passengers will not be affected as part of the proceedings, since CMA will continue to render services normally while it restructures its liabilities and brings its costs into line with market conditions. Likewise, Click and Link’s operations will not be affected as these airlines are independent of CMA, and therefore independent to the proceedings. CMA costs, particularly those associated to flight crews are well above industry average; such costs must be brought into line with market conditions to allow the Company to reach a restructuring agreement with its creditors in order to secure its financial viability well into the future. Since changing hands in 2006, CMA has made aggressive efforts to boost productivity by expanding and renewing fleet, enhancing its route network, as well as introducing state of the art technologies. These measures have translated into improved operating efficiency, savings in excess of US$800 million and has contributed resources superior to US$350 million. Although these initiatives helped offset a sharp drop in demand for air services due to the global financial crisis and the AH1N1 flu epidemic of 2009, the Company’s current cost structure makes it financially non-viable. Consequently, CMA is negotiating new collective labor contracts with its unions, and is confident they will result in a positive outcome enabling the Company to continue offering its customers world-class services at competitive fares. Under Mexican law, once the insolvency filing has been accepted, the judge will order the Company to continue operating to ensure services are not interrupted and that consumers are not adversely affected. The judge will also appoint an expert to oversee the proceedings up to the conciliation phase, during which CMA will attempt to reach a restructuring agreement with its creditors. CMA remains committed to its customers, commercial partners and employees, and will keep all parties updated on the progress of such restructuring process.